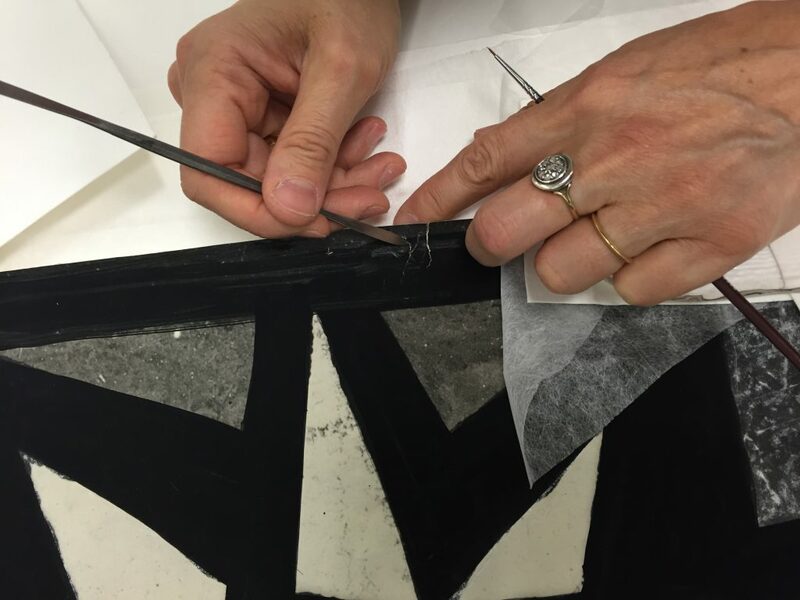 This post comes from Laura Hashimoto and Bonnie Hodul, Rakow Library interns who are helping conserve the Whitefriars stained glass cartoon collection over the summer in conjunction with West Lake Conservators. Read more about this project and the collection in previous posts. We are thrilled to have just completed two rolls containing objects by Whitefriars stained glass window designer Pierre Fourmaintraux for St. Peter’s Church, Lawrence Weston in Bristol, England. These rolls were discussed in an earlier post written by James Galbraith, Chief Librarian of the Rakow Library. 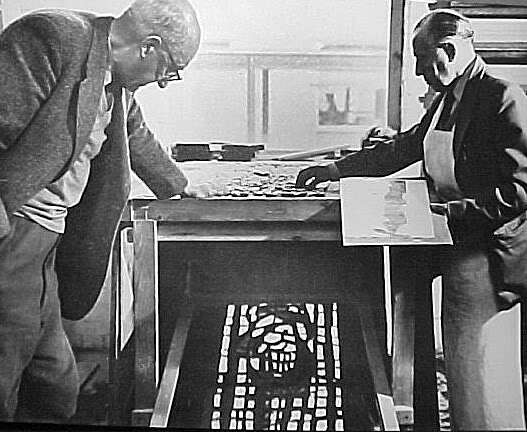 Fourmaintraux was renowned for his work in the dalle de verre process of stained glass window making. We were excited to learn more about this technique and to use our research to gain a better understanding of the drawings and photographs we unrolled and treated. We found “P. Fourmaintraux” signatures on the bottoms of the silver gelatin photographs. Dalle de verre, or faceted glass, was first developed in the 1930s. Contrary to traditional stained glass, which is set in lead, this faceted glass was set in a cement matrix (later an epoxy). The thickness of the glass and durability of the cement necessitated a more abstract approach to the design of the stained glass windows, as well as a strong use of negative space, as opposed to fine detail. These characteristics are present in Fourmaintraux’s working drawings and photographs. One of the rolls we treated contained five full-scale tracing paper drawings rendered in graphite (pencil), and depict the Life of Christ. These drawings relate to five of eight total installations in St. Peter’s Church. The second roll contained five full-scale silver gelatin photographs with painted media on top of the emulsion (gelatin) layer. These five photographs match the five tracings. We also have a third roll that we have not yet treated, which consists of three photographs without painted applied media on the surface, and depict the remaining three scenes from the Life of Christ at St. Peter’s Church. Bonnie and Laura condition reporting and surface cleaning two matching sets of tracing papers and photographs. The objects were fascinating both visually and from a research standpoint. We took some photomicrographs of samples of the dark brown, brittle “burn” holes present on all of the tracing papers (see our previous post). We also realized in studying the objects carefully that the markings were in a consistent pattern on the tracings. Simultaneously, we began to consider how full-scale photographs were used and physically painted upon to facilitate the stained glass window making process. Perhaps making a small sale drawing and using a photograph to blow the image up to full-scale made the process of creating the designs for these windows easier. The Stained Glass Association of America Reference and Technical Manual states that in the creation of dalle de verre stained glass windows, “cement also requires that a wire armature be incorporated into the panel for reinforcement against breaking.” We suspect that the wire armature was laid out and soldered right on top of the tracing papers, using the graphite drawings as guides. This might explain the linear burn and discoloration patterns that have damaged the tracing papers in these areas. 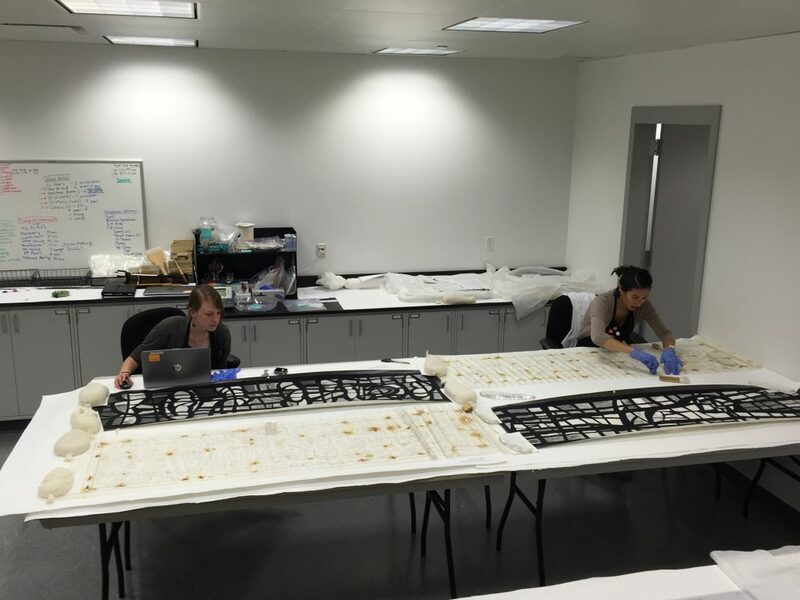 The frequency and very brittle nature of these brown spots meant that we had to adapt our conservation treatments in order to stabilize the objects so that they can be safely handled in the future. This included using humidification to initially unroll and examine the objects carefully (not all objects require this step), a longer amount of time in the humidification chamber to fully humidify and relax the tracing paper, and new mending procedures to prevent further losses of paper from the numerous burnt holes. “Before treatment” photograph of one of the tracing paper objects from St. Peter’s Church. “After treatment” photograph of the same object. The losses (holes) and dark brown discoloration pattern is thought to have been caused by the creation of the metal armature required for the interior of the cement matrix used in dalle de verre. The armature was possibly soldered with hot metal right on top of this object. The photographs with black painted media on top of the emulsion layer also had a white chalky medium on some areas of the emulsion. This white chalky media was very friable (easily removed) and had strayed and smudged onto the more secured black media. We had to adjust our surface cleaning, general handling, and humidification treatments in order to protect it and the emulsion surface. Stray white chalky media was easily smudged and very visible on the black painted media. The white chalky media was removed from the black media, while areas meant to contain the white chalky media in between the black media were left undisturbed. Photograph conservator Luisa Casella (West Lake Conservators) mending a tear on a silver gelatin photograph. For our goal of piecing the stages of Fourmaintraux’s process together, we were extremely fortunate to talk to Alex Werner, Head of History Collections at the Museum of London, where the presentation drawings from the Whitefriars’ company are held. Alex was able to send us photographs of some of the small-scale presentation drawings that matched our tracings and photographs. The Museum of London’s presentation drawings are rendered in color and in a miniature size compared to our 1:1 scale objects. It was thrilling to have another link between the inception of the designs and the installation of the final stained glass windows, and we are so pleased to be able to present four stages of Pierre Fourmaintraux’s process here. Enjoy! A photograph of the stained glass window installation at St. Peter’s Church, Lawrence Weston, Bristol (http://www.whitefriars.com/forum/index.php?topic=4720.0, courtesy of poster Mike CB). Follow the progress of the 2016 project. Kebrle, John, Helen Weis, Gregory Continas, Jacques Loire, and Natalie Loire. “Chapter 10: Dalle De Verre.” In Stained Glass Association of America Reference and Technical Manual. 1-31. 1992. Kebrle et al, “Chapter 10: Dalle De Verre.” 9. Kebrle et al, “Chapter 10: Dalle De Verre.” 25.
estoy muy feliz de encontrar este sitio, tengo 71 años en 1964 colabore en hacer vidrieras de cemento en Cali, para la capilla de la Umbria, seminario menor franciscano hoy campus de la universidad de san Buenaventura. deseo volver a hacer estas vidrieras, pero en colombia no hay quien venda los bloques de vidrio. en esa epoca nos los enviaron de alemania, Gracias por su trabajo. att. Alfredo Pelaez A.